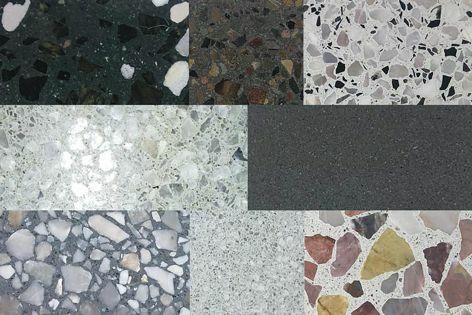 Offered in a wide selection of design options, this range of terrazzo tiling and overlay products can be used to create a unique look. With the option of tiles or overlay, precast or poured on site, the choices in the terrazzo range are endless. Beautiful, functional and timeless, Concrete Collaborative’s unique terrazzo tiling and overlay can be applied over any existing floor or poured to form countertops and other features, creating a modern, sophisticated and hard-wearing surface in the timeless aesthetic of terrazzo. Crafted from super-high-strength sustainable 100% Portland cement concrete, the result looks and feels like real concrete – because it is.